This Essay will be about the problem of distinguishing between the items mentioned in the title, but especially about the distinction between Genuine Property and Essential Quale (essential quality). In this and the next Essay we will moreover study the phenomenon of levels within a thing. We can distinguish between the level of the constituents and the level of the whole. But also with respect to the constituents themselves -- let us call them first-order constituents -- we can again distinguish between the level of their constituents -- second-order constituents -- and the level of the first-order constituents. Something analogous goes for functions. In the context of a preliminary solution these levels will tell us more about the location of Essence and its distinction from Genuine Properties. Perhaps the difference between Metaphysics and Natural Science is based on their respective viewpoints, resulting in different ways of description (of the same Reality), namely a high-level and a low-level description respectively. A Substance is an individual uniform thing, an intrinsic Totality. A Genuine Property is a property that is permanently present in the individual. It is called a proprium. A State is the situation in which the individual Substance finds itself at some particular point in time. It is called an Accident. But a proprium and an Accident can also be a term. Such terms, however, always signify something in Reality. The same goes for genus, species and (specific) difference. The genus expresses the Essence incompletely. (for instance animal). Metaphysics thus finds out what a genus, as genus (i.e. in its function of a generic term), is, what a species, as species is, etc. But in order to investigate this more deeply we must see where in Reality we actually find those entities signified by genera (generic terms), species (specific terms), differences (differential terms), propria (property terms) and accidents (accidental terms), and what way of being they represent. For in an attempt to indicate them concretely in all kinds of things, for example in individuals of a chemical crystal species, in all kinds of organic individuals, etc., we will gain more insight into what in fact these terms refer to, and with this our insight in the nature of Substance will be deepened. Exclusively relying on the example of man is not sufficient for our purposes. But even with respect to ontologically composed Substances (let alone 'separate Substances') it is in effect not possible to indicate explicitly and directly the essential differences. In the case of man this seems possible, but also here it turns out that the assumed difference cannot with certainty be assessed as a substantial difference. So "rational" is standardly assessed as a (specific) difference (in the above sense). But "rational" means ability to think, and this we derive from an introspective observation of one or another thinking activity. But thinking activity is an Accident, with respect to (what) man (is), it is an accidental form, not a substantial form (which is called -- in the case of man -- "soul"). And the (essential) difference should be taken from the (substantial) form (See St Thomas, De Ente et Essentia, Chapter 2, for instance line 177). Cognitive access to this substantial form of man is limited to its effects, and these are as such predicamental Accidents (i.e. exchangeable determinations). But perhaps we could consider "thinking activity" to be, it is true, just a state in which a human being can find himself, i.e. an Accident, but realize that this state (not permanently present in a human being) only can (at times) occur in virtue of something which belongs to the substantial form, and which we could indicate by "ability to think". And if this would also be just a state of a human being (in contrast with his essentials), then it is at least a 'permanent state', and as such it is wholly comparable with "ability to laugh". Just because of this comparability it seems, for the time being, to be justified to assume that "ability to think", and hence "rational", is just an effect of the substantial form (here, of the 'soul'), and that we, for the time being, prefer "ability to think", above "ability to laugh", to indicate, be it only by means of an effect, the essential difference. But if "ability to think" is (indeed) an effect of the substantial form, then we can say that it is one of the functions of the substantial form, and hence no (permanent) state, but an aspect of that substantial form itself after all. But the same goes for "ability to laugh". Is this also an aspect of that same substantial form? About these matters see St Thomas, S.T., I, q. 77, a. 1, ad 7. See also : ibid. q. 29, a. 1, ad 3. (For more, see BOBIK, J., (1965) 1970, On Being and Essence, p. 229, note 12). A Genuine Property (proprium) is a permanent state (of a Substance). If it can be found exclusively in (all the individuals of) one species, then it is a specific proprium (See St Thomas, In VII Met. lectio 4, nr. 1344--1346 and further). If it can also be found elsewhere (i.e. also in other species) as a permanent state, then it is a generic proprium (but only when it is found in all the species of the genus). A State s.str. (accidens) is an exchangeable determination of a Substance. This means that it can be replaced by another determination while the Essence remains the same. Only in the case of larger complex Wholes, like organisms (but also crystals), we clearly observe a Whole which maintains itself, which remains the same under changing states. So for example a human being. Also in the case of any crystal we observe that during growth its outer form changes to be sure (fast growing faces finally disappear, while slow growing faces are conserved), but its identity (whatness) remains the same. Additions of certain chemicals to the growing environment can also result in different outer forms of such a crystal. In an organism chemical changes take place continually during its individual existence, especially in cases of metamorphosis, observable in certain Insects, but also in all other cases. These changes should -- as seems plausible -- be interpreted as changes in its states (in which the individual finds itself). But in the case of free, small mixta, like small molecules, chemical changes can take place too. Methane, CH4, for instance, can be transformed into Monochlorinemethane CH3Cl. But it is hard to insist that such a change should be assessed as just a change of state in which (a) Methane (molecule) would find itself. Here we have to do with a substantial change ((also) according to Scholasticism). This despite the fact that in the course of that change something (having content) remains the same : The CH3 group is conserved, which indicates that the change was not a radical one. Nevertheless we obtain a new, different chemical. And only by stipulating that the properties, that ensue from the conserved CH3 group, are properties of the mixtum (CH3Cl), which just correspond to those of CH3 groups elsewhere (in other compounds), we can say that the relevant change reaches all the way down to Prime Matter (the CH3 group of Methane becomes the CH3 group of Monochlorinemethane), meaning that it is a substantial change ( NOTE 1 ). Hence it is in this case not a matter of conclusion that the transformation of Methane into Monochlorinemethane is a substantial (versus accidental) change, but a stipulation. This stipulation is, however, not without good reason : The molecules of the new chemical compound -- Monochlorinemethane -- each for themselves show a certain degree of unity and totality, and consequently a corresponding degree of being a Substance. But exactly the fact that a number of properties of the new molecule could be interpreted as conserved properties of some parts (in our case the CH3 group), makes matters such that an interpretation of the (status of the) new molecule as being an aggregate is not ruled out. Expressed differently, that fact allows for a reductionistic (versus holistic) interpretation of the new molecule. It must be noted, however, that this 'aggregate' is not equivalent to a mixture (it is a mixtum [perfectum], in classical terminology), and so not equivalent to a genuine aggregate. But this still doesn't mean that the new molecule should be a continuum. It is possibly one or another tight form of contiguum. So we seem to reach a conclusion which we also reached in the case of organic mixta, namely that we have to do with a contiguum, in this case an organized contiguum. This is consequently a totality-category situated between a genuine aggregate (non-organized, non-necessary, contiguum) and a genuine continuum (having only potential parts). Because of the above considerations we could ask ourselves whether there exist genuine (homogenous or heterogenous) continua in the material world at all. Such continua are perhaps to be expected in the world of quantum entities, and, perhaps in a lesser degree, in atoms. Compounds, consisting of several (chemically bonded) atoms, do, with respect to their degree of unity, correspond fairly well with single atoms, implying that we could perhaps ascribe a continuous nature to molecules of chemical compounds (and then also to crystals) as well. Expressed more accurately : they come close to such a continuum. The biggest problem however remains : we still wonder whether also organisms (including man) are genuine continua, like Scholasticism wants us to believe (See for example HOENEN, P., 1947, Philosophie der Anorganische Natuur, p. 334/5). They contain macroscopical moving parts, which -- in virtue of those movements -- are hard to interpret as being just virtually existing parts within the organism (i.e. not present as Substances themselves), as was observed earlier. HOENEN, 1947, p. 116, interprets moving parts within a Substance as a pure change in the distribution of the heterogeneity across the Substance, without any motion of its parts. But the latter is hard to accept. So also organisms are contigua. And apparently there are still more gradations within the totality-category of organized contigua, because inside a molecule the bonds between its constituents (atoms, or ions) are stronger than the bonds inside an organism are (i.e. bonds between its macroscopical parts). If we now view an organism as an organized contiguum (be it less tight than a single molecule), then we will have trouble with the Thomistic requirement of only one substantial form for each Substance, if we hold that such an organism, like for instance a human being, is one Substance. That a human being is indeed one Substance should, I think, not be denied. The degree of being-a-Totality of such a Substance (here the case of man) is however not as strong as Thomism wants us to believe, and accordingly not as strong as is the case with a single molecule, let alone a single atom. I am inclined to conclude in a preliminary way that a human being is indeed an organized contiguum, with an organization directed to the Whole (The same goes for free molecules, although closer to being a continuum) ( NOTE 2 ). This orientation of the 'parts' towards the Whole is clearly present and cannot be denied. However in organisms this orientation is not a culmination of the series atom-molecule-crystal-organism, because, as has been said, this orientation is also present in atoms, molecules and crystals. But it should be acceptable -- on the basis of this orientation of the parts towards the Whole, i.e. this holistic constitution -- to view an organism (including man) as having only one substantial form. The latter expresses this orientation of the parts towards the Whole, and does so in metaphysical terms. The ACTUALITY of moving parts (the presence of which cannot be denied) in an organism should enter (and be confined to) a description of that organism as it is at a LOW STRUCTURAL LEVEL, while the VIRTUALITY of the parts (also the moving parts) should enter (and be confined to) a description of that organism as it is at a HIGH STRUCTURAL LEVEL, and only as such it can enter a description of the ESSENCE of that organism. The first approach is followed by Natural Science. The second appoach is followed by Metaphysics. (See also the next Essay on Structural Levels). These findings should now be generalized, i.e. letting them refer to all real beings, and this means that they should also hold for inorganic beings. In the latter, however, the distinction of levels is not so clearly expressed as in organisms. But we can (with the exception of possibly genuine last entities) always distinguish between the level of the Whole and the level of the elements composing that Whole. The Essence is thereby always situated at the level of the Whole. The Essence of a being, say (i.e. call it), A, is what A is at a high level. A Property (proprium) is what A, at a high level, has. A State is something (a way of being) in which A, at a high level, happens to find itself. The phenomenon of "composition of something out of parts (elements)" [ = the phenomenon "composed of parts (elements)" ] is, insofar as "composed of parts (elements)", a whatness of the mixtum (as it is) at a low level, but is in fact not the whatness of the mixtum, but a summation of the whatnesses of the elements. What is the status of these levels? Are they (still) just levels of description, or are they objectively and really existing? Well, we could suggest that in a high-level consideration a semantic level is introduced, distinguished from a syntactic level . This syntactic level is the lower level, namely the level of the elements and their spatial and functional coherence. A consideration at this level is comparable to reading and evaluating a book at the level of its letters. The story and the plot are as such not present at that level. Because the parts merge into a Whole with an Identity of its own, and consequently with an Essence of its own, they can, departing from (seen from) that Identity, be interpreted as (only) virtually present. The Identity then corresponds with the one substantial form. Indeed a Totality can have only one Identity (at the same time), one (objective) meaning. Whether we have obtained in this way a plausible solution is, according to me, not completely certain. It is a view that is partly at variance with classical Thomism in which such a Whole is interpreted as a genuine continuum. It could become an amendment to that Thomism. The substantial form, within the proposed contiguum view, in which in one way or another levels can be distinguished, becomes more abstract. It is not something anymore that is, as it were, present in the thing in a concrete fashion. It becomes blurred into something like 'the Identity of the thing' and loses some of its fundamentality, because that form could turn out to be reducible to the parts and their interactions (In the dynamical systems approach all this will be worked out further). Smaller Wholes, like single molecules, can be interpreted in the same dual way (i.e. according to the level view given above), be it that their totality nature is, in a certain sense, more strongly expressed. They do not tolerate any idem specie chemical change. So with respect to chemical changes, the behavior of smaller Wholes appears to be quite different from that of large Wholes (like organisms). This was already observed earlier. But how things are in the case of very large molecules, like for instance Hemoglobin, that undergo a small chemical change (for instance the insertion of oxygen)? Is this a substantial change or just a change of state (i.e. an accidental change)? It appears that the Identity of something becomes as it were more stable the more the relevant Whole becomes larger and more complex. Only then we can clearly speak of changes of state of such a Whole of which the Identity is supposed to be conserved despite such (small) chemical changes (occurring to such a Whole). A strongly expressed Identity (a version of 'Self') comes gradually into being, it seems, as the Whole becomes larger and more complex ( NOTE 3 ). In larger Wholes several, i.e. higher and lower, structural levels appear (See the next Essay, and see also near the end of the Essay on The Mind-Body Problem ). This culminates in man. Hence we cannot, just like that, generalize the findings about an-Essence-which-remains-the-same in (the case of) man, to all beings, because, for example, in the transition of CH4 into CH3Cl we have to do with a substantial change, while many chemical changes in man are just accidental changes (like for instance the tanning of Socrates). Perhaps the occurrence of genuine properties of such an individual Essence is related to this. With respect to man we can mention only a few genuine properties : Most qualities and quantities are, in the case of man, just states, for instance being tanned, being 1.78 meter long, etc., while, on the other hand, in the case of a small mixtum like a molecule, its color (absorbtion spectrum) and its sizes are genuine properties (generic or specific propria). The states that could be distinguished in such a small mixtum are just some externals, like its state of motion, its energy state, etc. So if something of a small mixtum is changed, then that something could easily be a genuine property of that small mixtum. Precisely by investigating inorganic mixta like atoms, molecules and crystals, it will become clear what a proprium really is, and what the relative contribution of propria and states is, in constituting a being, and it becomes clear what it is about this contribution when we compare several types of beings in this respect. And we still have to deal with the problematic fact that a proprium is not exchangeable (for others) with respect to its subject, implying that the real distinction of such a proprium from its Substance is harder to grasp. With this we again touch the discussion with Nominalism. We have already more than once directed the attention to the problem of distinguishing propria from the Essence (the essential quales). The cause of this difficulty is the fact that the Essence, as specified in Classical Metaphysics, is -- as it turns out -- an effect, not a cause (which it should be, according to Classical Metaphysics). So it seems that we should locate the Essence somewhere in the causal domain of the thing, and the propria in the domain of the effects. In this way we indeed obtain a distinction between Essence and proprium. So "rational" (in "rational animal") is not an essential quale of man (as asserted in Classical Metaphysics), but a proprium, on all fours with, say, "the ability to laugh". It is an effect of the Essence. Equivalently we can say that "rational" ( = the ability to think) is an essential quale, in the sense of an essential d e t e r m i n a t i o n. And because it is a determination it is caused. In our case it is caused by the Essence, and consequently lies (as being an effect of the Essence) outside the Essence, like also "the ability to laugh" does. Indeed a dynamical system approach accomplishes this distinction clearly, by insisting that the Essence is the dynamical law of a dynamical system called, say, "Socrates" ("Plato" is another such system). So the stereochemical structure of a crystal is not its Essence, but a specific proprium, while the relevant dynamical law, governing the crystallization process, is the Essence of the crystal. A proprium is, like the replaceable accidents, a determination, in the sense that it is an effect of a determinant. With respect to propria this determinant is the Essence (dynamical law), while in the case of replaceable accidents it is partly the Essence, partly external agents. This stereochemical structure can be considered as being directly and necessarily generated by the relevant Essence of the crystal and exclusively by this Essence. It is, with respect to this Essence, a permanent state, a specific proprium. There are however also (other) states that are to be sure permanent with respect to that Essence, but also permanent in other crystal species. Such for example the Space Group only (comprising the translative and point symmetries ( NOTE 4 )), (another example is) the Crystal Class (comprising its point symmetries only), further, a number of optical properties, etc. These states, as also the stereochemical structure, are not states in the strict sense, because they are constant during the existence of each individual of a species (and also of a number of other species). They do not change within the species, and by implication not within the individual (whereas, for example, the crystal habit ( = outer form) does). But they are not specific propria (as is the stereochemical structure). They are generic propria ( NOTE 5 ). So they are permanent in one or another genus of crystals. We should investigate what this ontologically means. What is precisely a genus (not as genus, but each time one or another genus) in an ontological sense? It is clear that a generic proprium does not arise from a certain definite Essence in a necessary way, i.e. from one definite (type of) Essence, all others excluded), yet it is constant in a certain genus. One says : That something, which is signified by a generic term, is an aspect of the substantial form, which relates to that (other) aspect of that same substantial form, which is signified by the difference, as matter (relates) to form. But what then is "an aspect of the substantial form" in an ontological sense? Because of what has been established above, we should interpret the term "substantial form" as used here, not as the Essence (of the thing concerned), but as the direct effect of that Essence. If we interpret the Essence of a Totality (an individual intrinsic thing or being) as the dynamical law of the dynamical system that generates this thing from basic elements, then we could of course identify the substantial form with the (formal aspect of the) dynamical law. And if we do so, the substantial form is not the (direct) effect of the Essence anymore, but this Essence itself. And then the generic term signifies an aspect of the dynamical law. And this aspect relates to another aspect, signified by the difference term, of that same dynamical law, as matter relates to form. And if we know the dynamical law, then we can figure out what these aspects are. What we find is the genus and the difference in their ontological senses. Among the properties (or states) there are some that distinguish themselves in a certain way from other properties (or states), like "snub" -- See, for example, St Thomas, In VII Met., lectio 4, nr. 1354 -- and "male" -- See, for example, In VII Met., lectio 4, nr. 1344. For every property (s.l.) applies that it first of all should have a substrate (in order to exist), it must be a property of something (else). Many such properties, however, do not necessarily require a special appropriate substrate, taylored as it were especially for that particular (kind of) property. "White", for example, can be a property (s.l.) of a given organism, but also of a given inorganic being. The only restriction is that the substrate be a material one, because "white" involves an interaction with light, and light is metaphysically material. Light can indeed only interact with physical matter, which is founded in metaphysical matter. "Snub" and "male", on the other hand, do require a special appropriate substrate, not just any material substate. "Nose" is per se with respect to "snub", i.e. "snub" necessarily implies "nose". But "snub" is not per sewith respect to "nose", but per accidens (accidental), not every nose is a snub. So "snub" does not necessarily arise from "nose", and also not from "man". That's why "snub" is not a proprium but an Accident, meaning in this case a state. "Nose" -- as substrate -- is typical for "snub", and in this way "nose" is a kind of proprium for "snub". "Living being" is per se for "male", i.e. "male" necessarily implies "living being" (as substrate). "Male" can be a property of a living being only. But not every living being is male, and hence "male" is per accidens (accidental) with respect to "living being". A comparable phenomenon is the (sometimes occurring) enantiomorphism in molecules and in crystals. Enantiomorphism in general is the occurrence of mirror images of things that are in all other respects identical (See also at the end of the Essay Historical Individuum, Here-and-now Individuum). So for example our left and right hands. Each partner of such an enantiomorphic pair lacks mirror planes. There is no mechanical operation which could map (i.e. superimpose) one partner onto the other. Only reflection in a plane (or inversion in a point) can do so. Enantiomorphism does not occur in every genus of things, for example not in higher organisms (when the whole organism as such is considered). It does occur in parts of them, but not with respect to the whole individual, because higher organisms are individually unique in a high degree, resulting in no two individuals being identical, and also not being exactly symmetrical with respect to each other. But enantiomorphism is not in principle excluded in higher living beings, and thus, for example, "lefthandedness" (not in the usual sense of this term, but in the sense of one of the two partners of those enantiomorphic individuals) does not require a special appropriate substrate, it could in principle occur in every category of thing. If, however, the individual uniqueness in higher organisms turns out to be a necessary feature, for example in order to be able to support a self-consciousness, then enantiomorphism cannot occur in such organisms, because although a lefthanded organism differs from a righthanded one, satisfying as it seems the uniqueness of individuals, this difference is only relative, while, say, a fingerprint is something absolute, describable in the absence of other fingerprints (no reference is needed). Hence the uniqueness of individuals is not satisfied after all. "Left" cannot intrinsically be distinguished from "right". The distinction can only take place by means of something external, for instance by an arbitrary naming -- by the observer -- of one of them as, say, "left". The enantiomorphism of the two objects consists in the fact that a mirror plane can be placed between them, and this means that this pair -- taken as one whole -- can be mapped onto itself by reflection in that plane (i.e. if one has carried out the operation of reflection, relative to that mirror plane, on this pair, then one will obtain this same pair, totally unchanged, identical to the original pair). So intrinsically, enantiomorphic forms do not differ, and as such they consequently cannot occur in higher organisms (under the supposed uniqueness mentioned, for if enantiomorphism would indeed occur in those higher organisms, then we would have identical individuals). Seen in this way "enantiomorphism" (and consequently also : "left partner", or "right partner") indeed requires a special appropriate substrate, for example an inorganic substrate and not an organic substrate, or at least not such a substrate which is related to higher organisms, and so it is comparable with "gender" (and consequently also with : "male partner", or "female partner"). "Gender" requires an organic substrate, while "enantiomorphism" (under the mentioned supposition of uniqueness) requires an inorganic substrate (If the latter would mean "exclusively an inorganic substrate" then this is only true under the supposition that all organic individuals are necessarily unique). Enantiomorphism, as such and in a strict sense, occurs in simple mixta, like molecules and crystals. Figure 1. 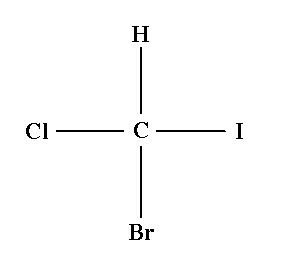 Structural formula of Chloro-bromo-iodo-methane. It is in fact a schematic projection of the 3-dimensional molecule onto a 2-dimensional plane. The molecule itself has the form of a regular tetrahedron, with the C-atom in its center and the other atoms at its apices. ---- Such a molecule can occur in two enantiomorphic forms, because the atoms, surrounding the Carbon atom are located at the apices of a regular tetrahedron, of which, with respect to the relative position of the four atomic species at those apices, two mirror images are possible. There is no mechanical operation that could superimpose the one onto the other. In crystals enantiomorphism can appear either in virtue of this molecular asymmetry, or by an asymmetry at a higher structural level. Such crystals, each for themselves, do not possess any plane of symmetry (See Figure 2). Figure 2. Quartz. Right-hand and Left-hand. After HURLBUT & KLEIN, 1977, Manual of Mineralogy. ---- This strict enantiomorphism in molecules and crystals is possible because their individuals lack individual uniqueness (where they do seem to have it, it is because of accidental features). In them the individual self (the unique self) is not, in this respect, present. Expressed differently, in them we miss the 'personal', the personal uniqueness. This is, in the strictest sense, only true with respect to molecules, while crystals, as they occur in Nature, will always show individual variations. But these variations -- for example inclusions, contaminations, deformations -- are purely extrinsic with respect to their causal origin, in the sense that the internal organization of the crystal does not play any role in their appearance. This in contradistinction to a genuine PERSON, where, in its formation, external causes also are involved, but where the internal organization plays a key role (namely by determining someone to be especially this, so and so natured, person). Of course the cause of that particular internal organization, different from that of another person, could in fact be extrinsic, but it is so only in the evolutionary and phyletic dimension. The genetic make-up of the fertilized eggcell directly determines -- and intrinsically so -- the personal difference. Hence molecules and crystals are a different type of Totality, a different type of Substance, different from higher organisms, especially man. "Snub", "male", "female", "lefthanded" (not in the usual sense), and "righthanded" (also not in the usual sense) are properties which, as has been said, require special appropriate substrates, and in this sense they are distinguished from many other properties (s.l. ), like "white". And for all properties applies -- and this is indeed emphazised by properties like "snubness" etc. -- that they cannot exist on their own. A genuine proprium requires (1) a definite (type of) substrate, and (2) the exclusion of other types of substrate for it to be received in, and (3) accompanies this substrate continually, unremittingly : wherever this substrate is present, that proprium is also present. For "snub" (1) and (2) applies, but it does not in all cases accompany this substrate, because not every nose is a snubnose. So "snub" is not a genuine proprium. Enantiomorphism has just been discussed as property. But it could alternatively be true that two enantiomorphous forms (say, two things which are intrinsically identical, except for their handedness -- one is lefthanded, the other righthanded) are, with respect to content, two different Substances, i.e. should be interpreted as such. In the Essay on Crystals I propose that Crystals, as Substances, are distinguished with respect to their specific content by their Chemical Composition + Space Group. Enantiomorphous forms, for example righthanded Quartz and lefthanded Quartz (See Figure 2), are different by their Space Groups i.e. they are represented by different Space Groups ( P3221 and P3121 ), and consequently we should interpret these forms as representing two specifically different Substances. Nevertheless we are inclined to view such enantiomorphous forms, for example of Quartz, as being just modifications, and so as properties anyway. This interesting problem should be further investigated. Here it is presented as just a problem. The ontological status of properties and states is not without difficulties. Properties are, as it seems, always one or another concrete (sub)configuration on or in a thing, or reducible to such a configuration, i.e. they are concrete parts of the given thing, and ontologically not distinguishing themselves from the latter. States can (in contrast to genuine properties), it is true, change (i.e. being replaced by other states), but the subject is never without some state (in which it finds itself). A state too is a concrete subconfiguration on or in the thing, or reducible to such a configuration, unless it is totally external. So also a state is a concrete part of the given thing. So it remains questionable whether with the grammatical distinction of subject and property or state (expressed as predicate) there is a corresponding ontological distinction. "This does not mean that the logical relation of subject and predicate expresses or reflects the ontological structure of matter and form. It is just based on it."